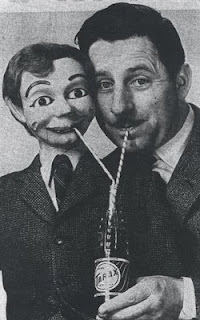 America had Charlie McCarthy, aka Edgar Bergan, England had Coster Joe, aka Fred Russell and Australia's most well known ventriloquist act was Gerry Gee, aka Ron Blaskett. Gerry appeared in the 1960's on a Children's Televsion show, that was in reality, a lemonade promo called The Tarax Show, Tarax being a popular brand of lemonade that was around at the time. The show begn in 1957 as The Happy Show, hosted by the congenial Happy Hammond and was changed to The Tarax Show not long after, running until 1969. 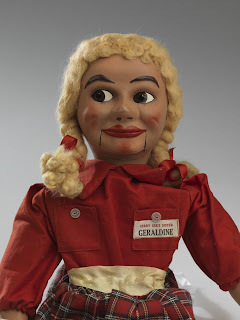 Due to the popularity of the act, a limited range of Gerry Gee merchandise was launched, including mini versions of Blaskett's dummy and a companion doll, Gerry's sister, Geraldine Gee, who wore long blonde plaits, tartan skirt and a green or red shirt. In 1998, Blaskett sold the original Gerry Gee through Leonard Joel Auctions for $17, 000. 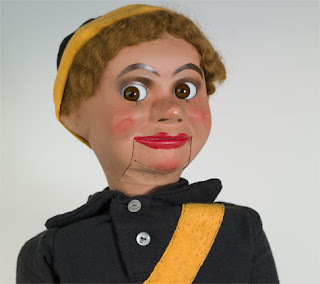 Cheap at the price I'd wager, for though the act was a little hokey/corny, Gerry Gee was after all, a significant icon in Australia's early TV history.